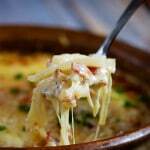 This hot cheese dip with onion and gruyere dip is one of our favorite appetizers! Melted gruyere, mixed with salty prosciutto, and savory onions. It’s really easy to make and absolutely over the top good! A great addition to your Oktoberfest party menu! 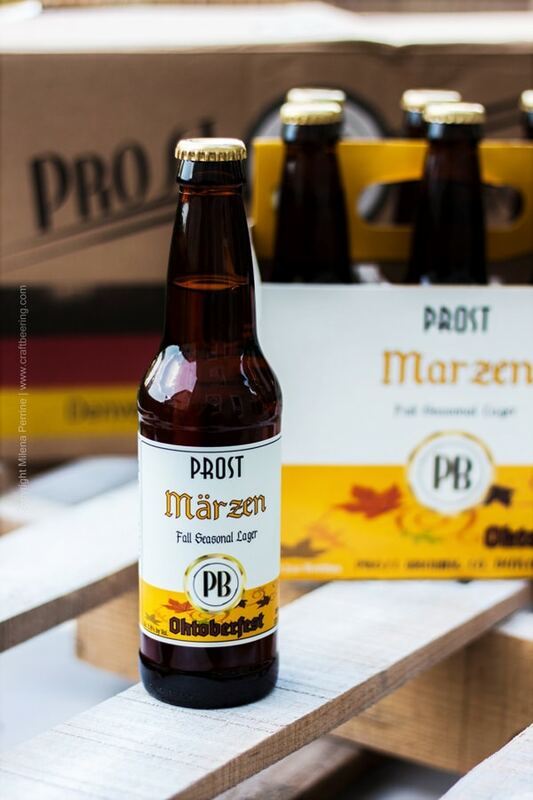 To help you celebrate Oktoberfest, we, and 9 other talented bloggers, are giving away a case of Marzen beer from Prost Brewing! See below for the details and links to other Oktoberfest recipes. They are fabulous! 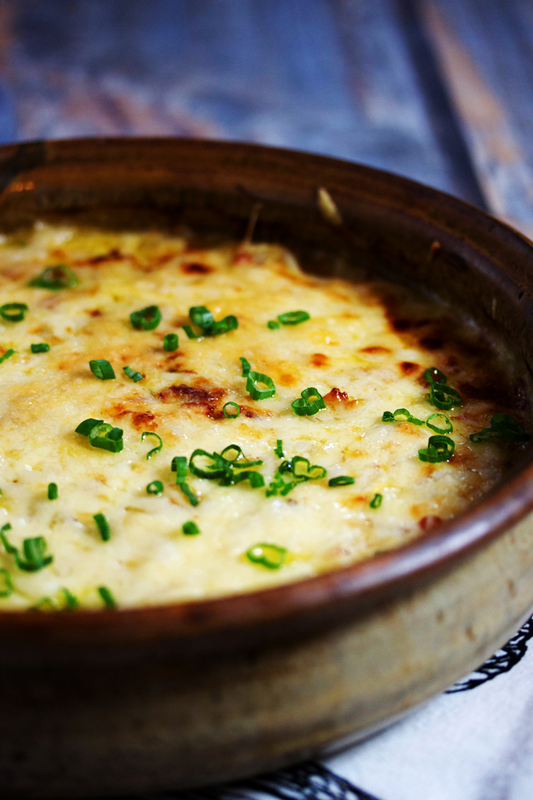 Let me introduce you to this hot cheese dip with onion and gruyere, a.k.a my favorite dip in the whole wide world! Oktoberfest is coming up soon and if your planning on throwing a party, this hot cheese dip would be a great addition to your spread. While gruyere cheese might be swiss, its very popular in Germany and is widely used in Bavarian and Alpine region recipes. First of all, this dip needs to be hot, so make sure to throw it in the oven just as your guests start to arrive. Then it will be warm and gooey melty by the time your friends head to the food table. Better yet, invest in a portable cooktop that can keep your dip warm for the duration of your party. These are invaluable for any party where you want to serve hot appetizers. 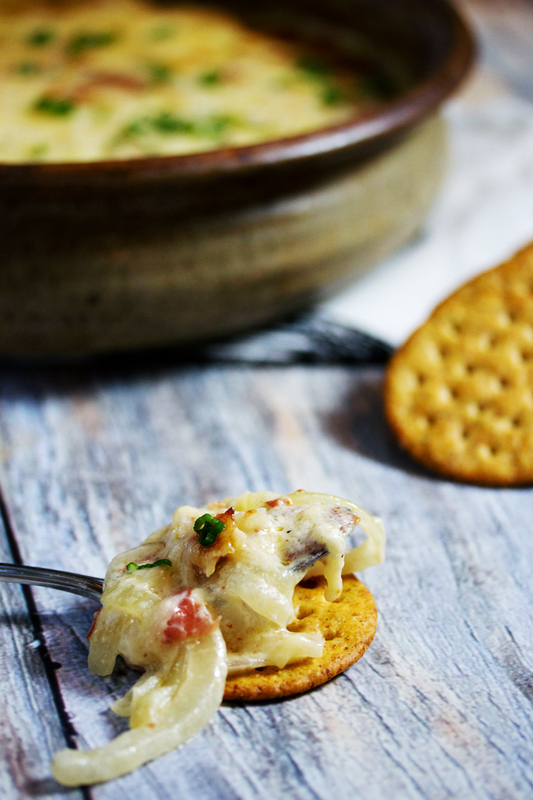 Serve this hot cheese dip with some buttery crackers, tortilla chips, or even some soft pretzels would be so amazing with this dip. These homemade soft pretzels would be so delicious dipped in this cheesy warm dip. First you want to preheat your oven to 350 degrees. Then get out a skillet and heat it on the stove over medium-low (or medium heat depending on your stove). Using a sharp knife, slice up your onions. Slice the onion in half first and then remove the top and bottom and skin. Slice the onion in 1/4 inch slices. If your onions are really big, also slice the half in half again so the slices are shorter. Add a little olive oil to your skillet and add the onions. Peel and mince your garlic and add that as well. Cook the onions till they are translucent, but you don’t want them to caramelize. We find that this dip is too sweet tasting with caramelized onions. If you want though, go ahead and try it caramelized. Its your dip! Slide them into a bowl and let them cool slightly. In the same pan, cook your prosciutto slices. They only need 30 seconds or so on each side. Take them out, let them cool slightly, then crumble them into the onions. Add the mayo, sour cream and shredded gruyere to the onions and mix to combine. Pour into an oven proof dish and slide into the oven for 20 mins or until melted and bubbly. Serve right away. Try not to caramelize the onions. Just cook them to the point where they start to turn brown but don’t go all the way. We find that this dip is too sweet tasting with caramelized onions. If you want though, go ahead and try it caramelized. Its your dip! Other Oktoberfest Recipes and a Giveaway! This contest is open to residents of the 48 contiguous states only. You must be 21+ years old to enter. If you’ve tried this hot cheese dip recipe then don’t forget to rate the recipe and let us know how it turned out in the comments below. We love hearing from you! 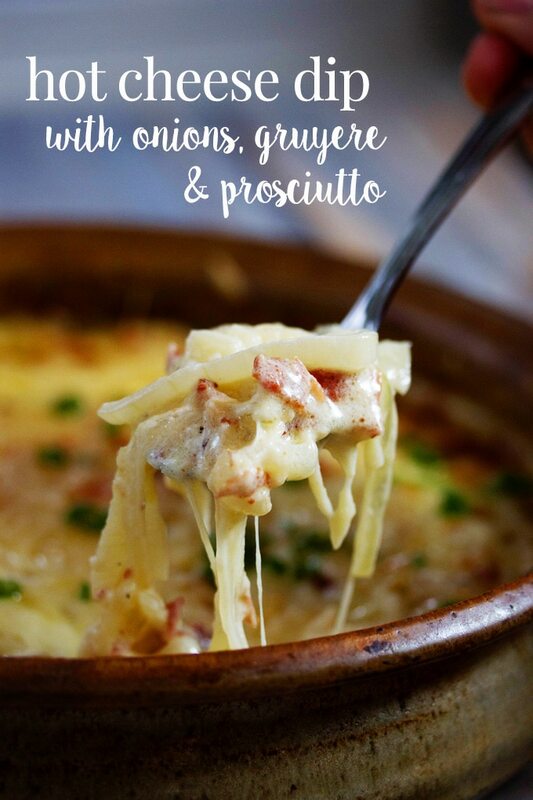 Melted gruyere, mixed with salty prosciutto, and savory onions. It's really easy to make and absolutely over the top good! Slice up your onions. Slice the onion in half first and then remove the top and bottom and skin. Slice the onion in 1/4 inch slices. If your onions are really big, also slice the half in half again so the slices are shorter. Add the olive oil to your skillet and add the onions. Peel and mince your garlic and add that as well. Cook the onions till they are translucent, but you don't want them to caramelize. We find that this dip is too sweet tasting with caramelized onions. If you want though, go ahead and try it caramelized. Its your dip! Slide them into a bowl and let them cool slightly. Pour into an oven proof dish and slide into the oven for 20 mins or until melted and bubbly. Sprinkle with green onion or chives before serving. Serve hot with crackers. 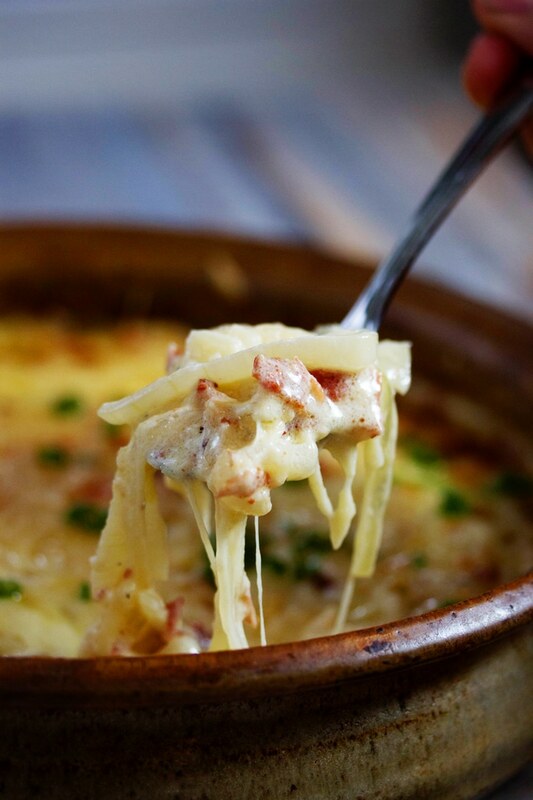 Gruyere is my ultimate indulgence, I seriously LOVE the stuff so I can imagine how delicious this dip tastes! Absolutely love this recipe! Yes, I do indeed see how good that looks! Cheese dip is daaa besssssttt. How can you go wrong with some delicious cheese dip? I love the additional ingredients you’ve added to really bring this together too. Perfect holiday dip! Hi Tiffany, thanks so much! I hope you give it a try. You will be hooked like Debbie and I.
Oh man, this looks so delicious! I am obsessed with cheese dips lately, I just can’t get enough! Hi Raquel, then you must try this one! Just one question-why did you mix metric and American measurements? You have cups and tablespoons and then grams for the cheese and prosciutto. Sorry, I’m not eager to drag out a metric scale for 2 ingredients. It is typical form to stay with one method of measurement. Hi Alison, its because thats how those ingredients are measured on the package that you buy them in. Therefore, its easy when you are purchasing your ingredients if they are listed in those measurements. omg this dip looks absolutely amazing!! Anything involving hot cheese is always a good idea in my book! Happy Oktoberfest! PINNING!! Hot cheese dip is seriously my weakness. I can’t say no to it. This looks amazing. Definitely trying this dip over Oktoberfest! Prost! I wish I could dive right in! just saying! Looks seriously good though! All melty and gooey, love the onion in there too! Oh my word. This is all I want to eat right now! It’s hard to go wrong with gooey, melty cheese :). This looks SOOOO GOOD! We pretty much can only make this when there is a lot of people around or we eat it ALL! This is calling my name! Looks so delicious ladies! LOL! Right? melted cheese is the best. Would you recommend Vidalia onions? Sure you could use them. They are a little on the sweet side so be careful not to caramelize them. Or do. But it will make the dip kind of sweet.